FUME plays into every inferiority complex the city of Washington has ever had. FUME examines D.C.’s short buildings and finds them lacking; it examines D.C.’s long acronyms and goes “pfft.” Those things you fear New Yorkers are saying about you? They are saying them about you! “Pfft” is right; I don’t know anyone outside of New York who even THINKS about what New Yorkers say about them, let alone FEAR it. But I digress. The article got me thinking about expatriate life: why we exile ourselves from our homes and how we deal with the conflicting sentiments of having done so. Paris is congested and noisy. A ride on the Métro at rush hour is—as I’ve posted more than once as my Facebook status—enough to make one hate the rest of humanity. And it’s hot and smelly. I pine for the clean, air-conditioned Metro of Washington, D.C., even if it is a tenth the size of the Parisian one. And being above ground is often no better. Crowded, narrow sidewalks, bottleneck traffic jams, and those infernal scooters teeming everywhere like droning swarms of exceptionally loud bees. And what they say about the … how can I put this diplomatically? … “courtesy” of Parisians, is pretty much true. But this is just a cultural difference. I’m from the southern U.S., where even service staff you’ve never met will call you “honey” and strike up a conversation as if you’re just hanging out with them for the afternoon. It’s different here. It’s not warm and cuddly. Smiles and expressions of thanks for patronizing businesses aren’t the norm. 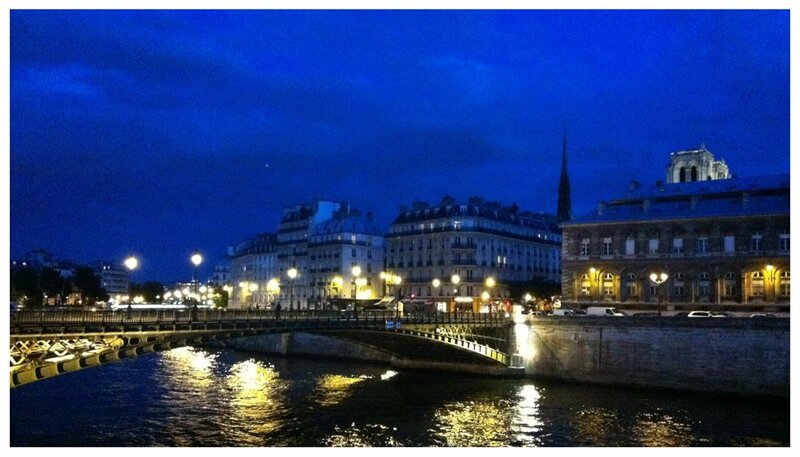 So what does Paris offer that brings us here and makes us stay (besides French spouses)? Well, no one makes cheese, wine, or bread (and that includes the most amazing pastries you can imagine) like the French do. I mean, once you have a warm tradition right out of the baker’s oven, you’ll never see American bread in the same light. And that great inefficiency I just railed against is the product of a lifestyle that puts a premium on your time, your friends and family, your happiness. Personal time gets a lot of respect here. And have you ever walked along the banks of the Seine at night, watching the lights dance around you, listening to music and chatter from little groups of drinking, smoking, happy students? The charm of this place is all of that … a melange of flavors, with just enough bitter to make the sweet that much sweeter. Do I complain about how rude people can be in the Métro and that there’s no air-conditioning and that it’s completely filthy? Do I complain about the epic scale of French bureaucratic inefficiency in everything from immigration services to healthcare? Do I complain that I can’t get a good donut in this city? Well, of course I do. But I’m not going to found a Fellowship of Unassimilated American Exiles in Paris, however tongue-in-cheek that might be. I’d much rather celebrate the charming things this place offers me that I can’t have back home—and grin (or as we do in Paris, faire la tête) and bear the rest (with an occasional grumble or two). • Language note: Faire la tête literally means “do the head,” and is the annoyed to slightly angry expression Parisians sport in the Métro. It is most easily approximated by non-natives by staring straight ahead and imagining that you’ve just eaten a lemon. ← You’ve got eighteen months to get to France … to save your life! I desperately want to read about your dealings with the French government. I’ve had just enough dealings with them from abroad to be incredibly sympathetic. I assure you that there are many anecdotes to share, and you’ll probably see one pop up before next week. The next entry will probably be a travel post, though. I’m going to try to do a weekly or bi-weekly post highlighting a destination in France that I’ve visited and for which I can share some useful insights. Subscribe and stay tuned! And thanks for posting the very first comment on my blog! NP – I don’t “subscribe”, but it’s in my RSS. well, darn…i’ll have to be second.